Elder Nathan Hales: Fellow missionaries and ....ummm.....a statue? 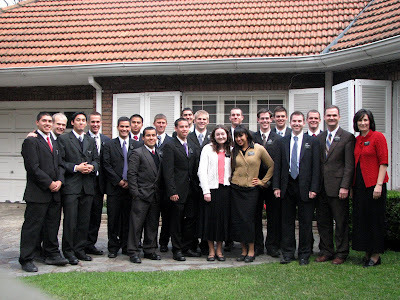 Fellow missionaries and ....ummm.....a statue? These are some of my friends that were with me on the plane ride here. Also, during my trip to the mission home 2 weeks ago we passed this giant metal flower thing. I think its famous or something. I´m a fan. It would be a great lawn decoration. September 9th training meeting at the mission home. All the new Elders and Sisters and their companions with President and Sister Argyle.